But Solti is the conductor on the live set I was listening to, and much of it I found just too loud and overblown. You could argue that the piece itself is loud and overblown, but I prefer a conductor who plays down these elements, and I already have a couple of Sawallisch Strauss performances (Arabella and Capriccio) which I like. I can of course listen to all of them on Spotify. In my opinion the 2014 Weigle set is very much worth hearing. Both are live recordings recorded at the Frankfurt opera in modern sound. Here's an in-depth (very long) review of Weigle's Frau. I have just bought the Solti (bargain second hand) and have started listening but it is heavy going. 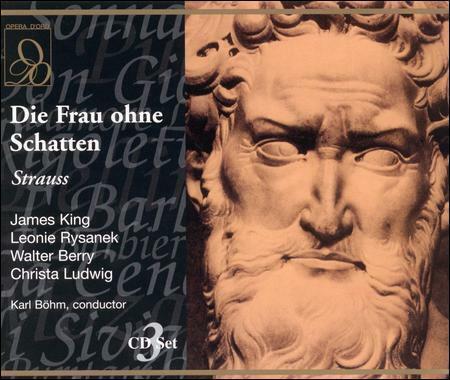 To me, Die Frau reminds me of Wagner opera. Heavy going but well worth the trip! I' am a really fan of Studer. The conducting is marvelous. René Kollo sounds too dry and i think he had the voice too used, but in the great monologue he rocks!! !